At the NAI plant in Suzhou, China, two initiatives were chosen to begin their new outreach program. 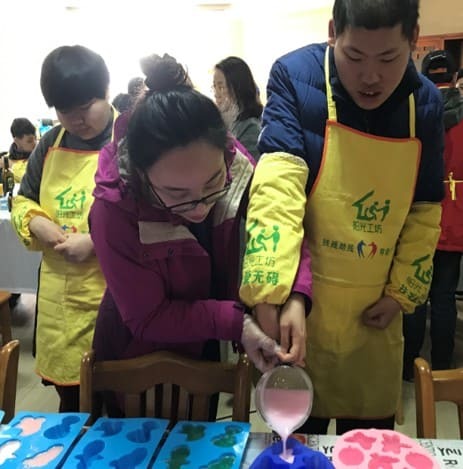 The first was a “Sunshine Workshop” soap-making project, where 63 NAI employees voluntarily worked with disabled children at the Dream of Love Community organization to make bars of soap. The soap and other items were later sold at a charity sale, which raised over 2000RMB. The proceeds were donated to the Dream of Love Community. Suzhou’s second initiative provided support to the poor children in a small town in the Gansu province, who suffer from poverty, a lack of food and adequate utility resources. NAI employees launched a charity event to collect clothing donations. In just a few weeks, they collected 27 boxes of clothing to distribute to the children of Gansu. “By expanding the company’s social impact, our employees become a motivated and happy workforce,” stated Liza Li, Senior Human Resources Manager at NAI, Suzhou, China.